Can Juicing Make You Tired? Proponents of juicing claim they have unbounded energy due to the load of vitamins, minerals and antioxidants they're taking in. Juice cleanses, in which you surrender most or all whole food in favor of green drinks, also promise that you'll remove toxins from your body so you feel less foggy and fatigued. The downside to juicing is that it can leave you deficient in protein and calories, resulting in tiredness and malaise. Registered dietitian Joy Bauer points out that many juicing plans don't include sufficient protein, a macronutrient that helps meals feel satisfying and energizing and boosts metabolism. These plans may cause you to lose weight rather quickly, due to your decreased calorie intake, but they can slow your metabolism and cause you to lose muscle mass along with fat. If you do make juice, have it alongside a meal that contains protein -- such as eggs, meat, fish or soy -- or make sure your other meals that day include adequate protein. True juices, extracted with a juicer and made primarily with fresh fruits, contain natural sugars and no fiber, protein or fat to slow digestion. These sugars have the same blood sugar-spiking effect as processed sugars when you consume them in excess. After an almost immediate rush of energy comes a crash, characterized by headaches, irritability, dizziness and fatigue. 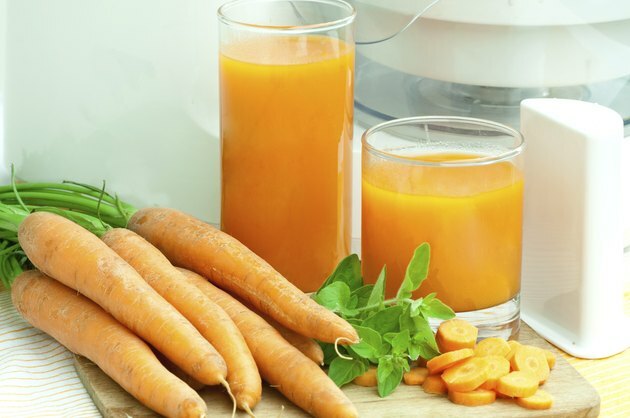 To keep the sugar content in line and help ward off sugar crashes, make juices with a ratio of at least 3 parts veggies to 1 part fruit, recommends registered dietitian Kathie Swift in Experience Life magazine. Pulverizing fruits in a high-speed blender to create a juicelike product does retain some of the fiber and thus dulls the blood sugar-spiking effects, too. A dramatic reduction in calories, which occurs with many juice fasts, can also cause you to feel weak and fatigued. Your body needs a certain number of calories to perform simple bodily functions, such as breathing and pumping blood, and to perform daily activities. If you also exercise, you need additional calories to support the workouts and recover afterward. Without enough calories, your body will start to slow down and make you feel tired to prevent you from overexerting and using up all its energy stores. If juicing isn't accompanied by sufficient servings of whole meals, you may find yourself famished. Bauer recommends having juice along with meals or replacing no more than one meal per day so you don't end up hungry or deficient in nutrients. Those meals should still contain whole fruits and vegetables, which provide the fiber that's lost in the juicing process, as well as lean proteins, dairy products and whole grains. No research supports claims that juicing helps remove toxins from your body. Your internal organs, if healthy, naturally detoxify your system on a regular basis. Real Simple: Is a Juice Cleanse Good for You? Food Matters: Juicing vs. Blending: Which One Is Better?